In thinking about holiday parties this year, I always like to buy a little something new for myself to wear. When I saw Carrie Underwood's performance on Jimmy Fallon, I thought, "That is it! A fun holiday skirt!" Pair it with a black sweater and some tights (things I already have) and it looks so cute. Now, if I could only look a little more like Carrie Underwood, the Holidays would be complete! haha I don't think I have enough money for that. Apparently I don't have enough money for that skirt either. Here is the closest thing I could find. 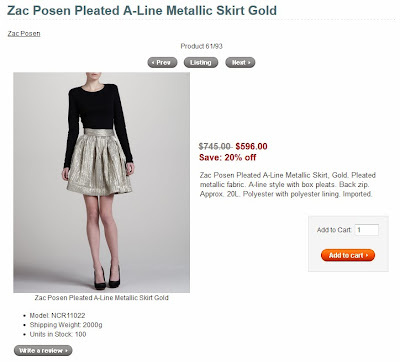 Even on sale, this one is out of my price range at $596.00! If anyone has any leads on where I could find a similar skirt less than $100, give me a shout, but for now I think I will be making an attempt with the old Singer machine. I should have it done in time for Holidays 2014!